Are we nearing the end of the buy-to-let boom? The increase in buy-to-let mortgages in recent years has been staggering, with buy-to-let accounting for 4% of mortgage lending in 2000, compared to 16% by Q2 of 2015. The reason is plain to see – the rental market is largely buoyant so rental prices and occupancy rates are high and the value of the majority of UK property has only being going one way, and that’s up. Many analysts and industry experts still believe property prices will continue to rise, in which case the opportunity is surely still enormous for buy-to-let landlords. However, Mr Osborne has other ideas and changes announced in the July budget mean that many landlords will now become financially worse off. As things stand, landlords can claim tax relief on monthly interest repayments at the level of income tax that they pay. Over the next four years from 2017, this mortgage interest tax relief will be capped at a maximum of the basic rate of income tax (currently 20%) and if a client is a higher or additional rate taxpayer, they will therefore start to lose out. Landlords of furnished properties also currently get a ‘wear and tear’ allowance, whereby they can offset a further 10% of their rental income against tax for maintenance, regardless of whether they have carried out repairs or not. This is also going to be scrapped and from April 2016 they will only be able to claim for maintenance and renewals that they can prove has taken place. In the face of these changes some clients may choose to cash in profits and sell their buy-to-let properties, and thus face the next problem – capital gains tax (CGT). A higher rate taxpayer will have to pay 28% on all the realised profits, making quite a dent in their return. The Enterprise Investment Scheme (EIS) could be a potential solution. Introduced by the Government in 1994, EIS offers a number of tax reliefs that could be of benefit in this situation. Unlimited CGT deferral – by investing in an EIS the landlord can defer the payment of CGT for as long as the shares are held. 30% income tax relief – the landlord can claim back 30% of their EIS investment (assuming they have paid that much), in income tax. This can be applied to the current and/or previous tax year, and tax on rental income can be reclaimed. Inheritance tax (IHT) mitigation – EIS shares also qualify for Business Relief (BPR), with shares becoming exempt from IHT after they have been held for 2 years, and at time of death. 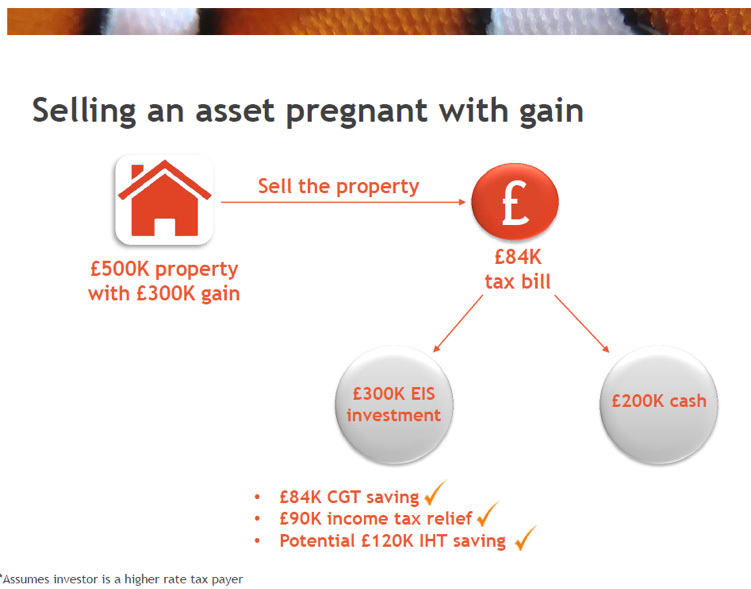 Strip out their CGT allowance every year after the 3 year investment period, meaning the gain can be washed through. Retain the EIS shares until death, whereby the gain would die with them. Use the income tax relief they claim back to facilitate the payment of the CGT and then sell the EIS shares. There is no reclaim of income tax relief beyond the 3 year investment period. Investors have to be comfortable with the 3-year investment period, and investments are made in to small, unquoted companies that usually offer poorer liquidity and higher investment risk. However, many providers offer EIS that target capital preservation and for those comfortable with the risks, EIS could provide an interesting solution to their tax problem.